GMCI | Shrink to Grow: Does your country portfolio need a retrenchment strategy? After a period of rapid global expansion, many multinational companies today find themselves over-extended, operating in too many countries, many of them fitting into the “low margin, low growth” category. The overall result is high complexity—and the unforeseen costs associated with that complexity—and worse, top-line revenue growth that has slowed, or even reversed. For these companies, the right decision may be a retrenchment strategy that minimizes the risks associated with complexity and improves the financial position. This exercise can be critical in setting up a company for greater scale and overall profitability. The Global Markets Complexity Index (GMCI) provides a framework for identifying geographies misaligned with a company’s strengths and therefore opportunities for smart retrenchment. Between 1990 and 2005, McDonald’s and KFC’s combined foreign sales rose 400%, largely driven by their entry into the Chinese market. Despite top-line success, foreign profits declined at both companies between 2012 and 2017, largely driven by China—the companies have since retrenched. In 2016, KFC’s parent, Yum! Brands, spun-off its China business and in 2017, McDonald’s sold a majority stake in China operations to a state-owned firm. Their retrenchment highlights the difficulty of navigating complex foreign environments, despite attractive macro indicators such as population and GDP growth. What went wrong for these companies? The GMCI provides a new tool for assessing opportunities and diagnosing problems of global expansion. 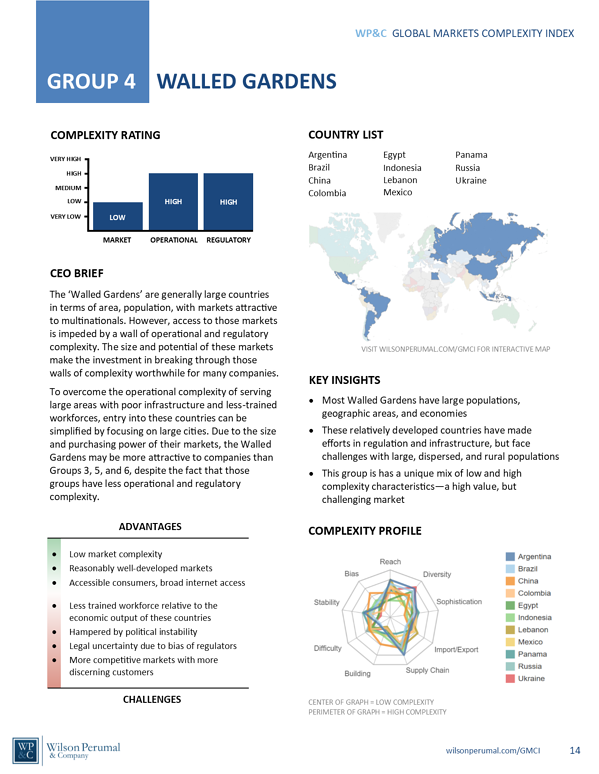 It analyzes market, operational, and regulatory complexity to divide 83 countries into eight groups with similar complexity profiles. Current success in one country suggests the opportunity to leverage complexity management capabilities in other countries in the same group. Conversely, the GMCI can also help companies better understand under-performance in foreign markets, and assess the benefits of an exit. China is part of GMCI Group 4 (Walled Gardens)—you can download the report on the GMCI page. Countries in this group are attractive due their size and growth potential, but access and performance are challenged by significant operational and regulatory complexity. Both McDonald’s and KFC struggled with food safety scandals, the result of poorly enforced regulations at Chinese food suppliers. The companies appear to have underestimated the risk of operating in countries where food safety standards are less established and less enforced. China’s regulatory environment is also famously biased toward local firms, adding another layer of complexity for multinationals to consider. The food scandals were uncovered by state-owned media and specifically targeted multinational firms. And as their popularity grew, KFC and McDonald’s had to compete with an increasing number of home-grown Chinese fast-food outlets that benefitted from regulatory favoritism. KFC and McDonald’s would have undoubtedly benefited from the GMCI perspective at time of market entry. Their retrenchment strategies are aligned with the GMCI analysis. McDonald’s sold a majority stake to a state-owned firm, but the structure of the deal allowed it to maintain a financial stake in the form of franchise fees without being burdened by the regulatory complexities of opening, maintaining, and supplying stores within China’s “Walled Garden.” In 2015, Yum! brands chose to spin off their Chinese KFC business as a separate, publicly traded entity which pays its former parent a percentage of revenue in exchange for future brand rights. 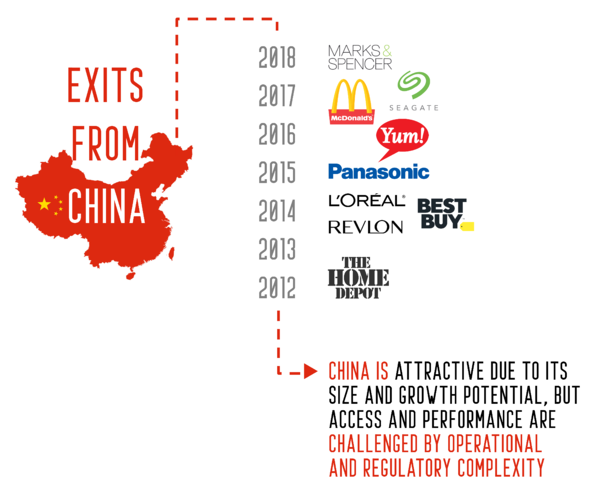 Both companies’ retrenchment strategies respond to China’s unique complexity profile. Going forward, McDonald’s and KFC are more shielded from complexity risk and will also enjoy a financial stake in a large, growing market. Understanding the unique type and degree of complexity you will face in a foreign market is crucial to successful international expansion. The GMCI complexity profiles are designed to enrich, not replace, the due diligence required to inform expansion and contraction decisions. Engaging with the GMCI framework uniquely equips you to diagnose under-performing markets in your country portfolio and develop an exit, retrenchment, or consolidation strategy that best positions your company for long-term, profitable growth. You can find our full report and interactive tool at www.wilsonperumal.com/GMCI.